The car is working great - it was over 2,600 miles on it now. As you can see on my mileage tracker, the longest range so far is 200 miles and the most natural gas I've refueled it with 6.1 gge. The refueling ease has been a welcome surprise; there are less fueling locations, but the process is just as quick as fueling with gasoline. The oil life indicator shows 70% oil life remaining so the oil change frequency is much less than a gasoline vehicle. This Google Map shows all the fuel stations I've used so far, and the furtherest destinations in the Honda Civic GX. The Stroud fuel dispenser is located at the turnpike McDonald's/gas station - it's very convenient. It's very satisfying to be driving this car that is so cheap to operate and so environmentally friendly; while others around the US are having to wait and wait for the promises of plug-in hybrids. We are so blessed to have the CNG infrastructure in Oklahoma! 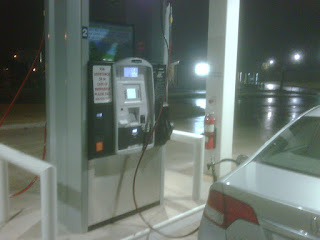 Here's the latest new station in Oklahoma City - just south of I-44 on Western Ave. Right off I-44 on Western.